Indiana University McKinney School of Law, Indianapolis, 2005 J.D. Joe leads the firm’s Employment Law Practice. He learned both client service and “workplace psychology” from his grandfather, uncles, and parents at an early age, as he grew up amidst a Hoosier family grocery business with a workforce of several hundred. That same experience gave Joe a special appreciation for the stress that employers and their managers confront when navigating the many different legal challenges posed by under-performing, ill, sad, angry, or other “challenging” employees. In his law practice, Joe has a particular passion for counseling employers through sensitive workplace investigations, employee medical issues, theft and embezzlement, workplace violence, and other employment challenges. He works with family- and other privately-owned businesses, non-profits, municipalities, and education clients where he both develops policies and practices and is their employment law “problem solver” on delicate employee matters. He counsels on all phases of the employment relationship, from recruiting and hire all the way through termination and unemployment claims. Joe regularly trains clients’ HR and supervisory teams on compliance issues and assists in personnel policy/process development, reorganizations, and reductions in force. Joe also litigates the full spectrum of employment-law issues and has handled hundreds of cases before state and federal trial courts (both inside and outside Indiana), the EEOC, Indiana Civil Rights Commission, and other state, federal, and local agencies. Joe has defended discrimination claims of nearly every stripe, including those under the Family and Medical Leave Act (FMLA), the Americans with Disabilities Act (ADA), Title VII, and the Age Discrimination in Employment Act (ADEA). He has also litigated restrictive covenants in employment, Fair Labor Standards Act (FLSA) claims, wage payment claims, and wrongful discharge actions. He is admitted to practice before the U.S. Court of Appeals for the Second, Third, and Seventh Circuits as well as the U.S. District Courts for the Northern and Southern Districts of Indiana and all Indiana state courts. 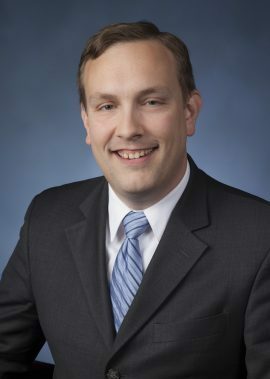 He has been recognized as a Rising Star by Indiana Super Lawyers every year since 2013. Joe grew up in Hamilton County and graduated from Cathedral High School in Indianapolis. He and his family reside in Westfield and are parishioners at St. Louis de Montfort in Fishers, where Joe also serves as a member of the School Advisory Council. He is also a member of the Board of Directors of Heritage Place of Indianapolis, Inc., a non-profit dedicated to providing home- and center-based services to area seniors. Por que no habla usted ingles? Can You Institute an “English-only” Rule?